Curb appeal is that first impression you get as you approach a house from the street. It includes the home exterior and all of its elements, the landscape, the front, side and back yards, the driveway, the walkway leading up to the front door, and even the street in front of the house. An attractive home exterior and landscaped yard can add thousands to the value of your house, helping it to sell faster and for more money! The first glimpse of your home exterior should impact buyers in a positive way. It should be your goal, as a home seller, to make your house exterior look so appealing that home buyers can’t wait to get inside! This makes staging the outside of your home just as important as staging the inside. Look at your home exterior with "buyer's eyes"
Walk across the street from your house and try to view it from a buyer's perspective. What stands out? Perhaps you can’t even see your house because it has been overtaken by a jungle of overgrown trees and shrubs. Do the exterior paint colors clash with the rest of the neighborhood? Every little thing that's wrong with your house WILL BE NOTICED by home buyers. They will take note of every flaw and use it as ammo to negotiate the price of your house down. View your home at night, as well. Will house hunters have to stumble their way to the front door in the dark because of the lack of outdoor landscape lighting? If you're having a hard time evaluating the curb appeal of your own home, ask a neighbor or friend for their opinion-- don’t be offended, though. Remember, your ultimate goal is to sell your house fast and for more money. Remove outdoor clutter such as, gardening tools, hoses, kid’s toys, a rusty swing set, sports equipment, outdoor accessories like garden gnomes and flamingos, shoddy patio furniture, leaves, broken tree branches, and for goodness sake! Take down the out-of-season Christmas lights! While you're at it, this is also a great time to have a garage or yard sale. Hide garbage cans, and if you have pets, keep the yard free of animal debris. Oil or propane tanks are never pretty, and if you have one that is particularly dirty, wash it and add a fresh coat of paint. To make it blend in, use the same paint colors as the house. Maintain and clean up your pool or hot tub. These great features should be sparkling and inviting, not resembling something a swamp creature may crawl out of. Clean the air-conditioning condenser. Turn off the power and clear away leaves and debris that may be trapped in the unit. Use a garden hose to wash out the coils. Rake up all dead branches, twigs and leaves from your lawn and garden. De-thatch dead grass with a metal rake or thatcher. Treat your lawn to a "greening" fertilizer like "Scott's Green MAX." 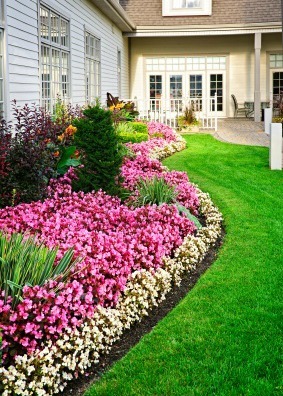 A well-manicured lawn will boost the curb appeal of your home exterior. Fill in bare or brown patches of lawn with grass seed and keep watered and mowed. Edging between the lawn, sidewalk, or flower beds will make the garden design look tidy and well cared for. Trees and shrubs should be neatly trimmed for best curb appeal. Prune back any overgrown trees or shrubs that block the house from the street, hang heavily over the roof or that prevent natural light from entering the home interior. Be sure to trim shrubs that block the walkway leading up the front door. There should be enough room for two people to walk shoulder-to-shoulder on the path without brushing against shrubbery. Does your lawn have bare or brown patches that need filling in fast? Try this quick solution by www.patchperfect.com. This company claims that its grass seed will fill in bare spots in the lawn faster than normal grass seed and with virtually no help from the homeowner except for watering. Flowerbeds should be tidied of weeds and dead plants. Keep flower blossoms deadheaded. 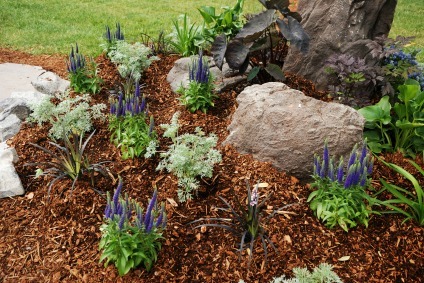 Apply a 2 to 3 inch layer of mulch on the surface of the flowerbeds to accentuate the plantings and enhance the landscape design. Clean out all the weeds! Add attractive boulders and rocks to the garden design for texture and variety. Sculptural features, like a birdbath or statue, will add a fun element to your garden design. Add a gurgling water feature to your outdoor landscape-- buyers love them! Fill in bare spots in the garden with inexpensive nursery annuals. If you're in a hurry, bury inexpensive nursery flowers or shrubs in their pots into the garden beds. With a layer of mulch on top, no one will ever know. The front porch will set the tone for the rest of the house. If the walkway or stairs leading up to your porch are in dire need of repair, this is the time to fix them. Light the path leading up to the front porch for night viewings. Inexpensive solar-powered LED lights can be purchased at any home improvement store. No fuss to install, just push into the ground. If you still have last year's Christmas wreath clinging desperately to the front door, and this is summer, home buyers may form an immediate bad impression. Keep the front porch clear of boots, shoes, umbrellas, kid's toys, etc. Depersonalize your home by removing plaques with your name on them-- take them to your new home. Home buyers will have an easier time seeing themselves in the home without your name on it. For a dark front entry, replace the front door with a windowed door to bring natural light in. If privacy is an issue, apply frosted window film, found at most home supply centers. It's easy to apply and can be removed later. 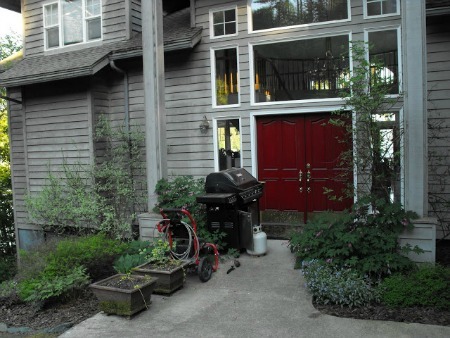 The front entry in the picture on the right just needs tidying up for better curb appeal. Everything should be removed to create a clear path to the front door. The shrubs need pruning, and garden and flower boxes freshened with flowers or greenery. The garden bed will also benefit from a fresh layer of mulch. Outdoor landscape lighting would enhance this front entry for night viewings, perhaps in the garden or lining the path. The front door is often the focal point on the front of a house--it should grab the eye and lure visitors in. According to the principles of feng shui, the front door and foyer should welcome and direct the flow of energy into the house, rather than push it away or weaken it. This is where you want to use your favorite bold, bright color. 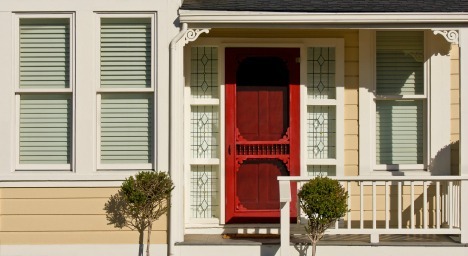 Select a door color that coordinates or compliments the paint colors of your home exterior. Use a high-gloss paint on the front door. This will give your door a lovely reflective sheen. Front door hardware and kickplate should be polished and gleaming. Use a good metal cleaner like, "Brasso Metal Polish". The doorbell should be in good working order and house numbers should be easily seen from the street. Choose house numbers that compliment the style of your house design. Replace old or outdated outdoor lighting fixtures with ones that match the style of your home. Washing dirt and grime from your house exterior will add value to your home by giving it curb appeal. A bucket of soapy water and a long handled brush may be all you need to clean it. If soap and water doesn't work, try using a solution of 1/2 cup TSP (trisodium phosphate) dissolved in a gallon of water. You can get TSP at any hardware and home improvement store. I have successfully scrubbed mold off my own house using a mixture of 20% bleach and water. Wet the siding first with a hose, apply the bleach mixture to the exterior with a brush, then rinse off. It may take a few applications to remove all the mold. Clean engineered wood, aluminum, or vinyl siding with an all-purpose cleaner using a nylon scrub brush. Check for rot on wood siding and replace if necessary. The most commonly offered advice from real estate professionals, home stagers and appraisers is to paint the home exterior. House hunters love a freshly painted house, and appraisers will figure it into the value of your home. Painting the home exterior is a big job, costing you time and money. But it may make the difference in whether your house languishes on the market, or is sold quickly. If you can’t afford to paint the entire house, just paint the front and sides seen from the curb. Or, put a fresh coat on the front door, porch, or exterior trim to punch up the curb appeal. When selecting home exterior paint colors, don’t get carried away with bold or unusual colors. Instead, select exterior paint colors that fit in well with the other houses in your neighborhood. In Real Estate terms, this is called the principle of conformity, which means that the highest value is created when a property is in harmony with its surroundings. For instance, a mid-century modern house in a neighborhood of old Victorian-style homes will be the one house that stands apart. It may be a great house, but it becomes the "oddball" in the neighborhood that many buyers won't want to buy. Even a bright exterior paint color in a neighborhood full of neutral grays may be enough to turn home buyers off. They will be thinking of all the work it'll take to re-paint! Broken or cracked window panes should be replaced. Window trim in need of painting should be touched up or repainted, otherwise, the house will look neglected. Remove any paint on window panes carefully with a razor. Look for wood rot or caulking that may need replacing. And of course, the outside of the windows should be spotlessy clean and all cobwebs swiped away. Wash windows with a mixture of 1 cup vinegar, 1 cup ammonia and 1 gallon of hot water. Follow up with a second washing using just water. Dry with a squeegee rather than a rag or paper towels to prevent streaks. Wash windows on a cloudy day. If you wash on a hot sunny day, the cleaning solution may dry too fast, causing streaky windows. Remove moss from the roof! If you don't take care of roof problems now, you will pay for it later when the home inspection comes back. If your roof has a leak, fix it. Otherwise, buyers will insist on an entire new roof. Stand back from your roof and look at it with a pair of binoculars. Look for curling or missing shingles and damaged metal flashings. Replace missing shingles and repair flashings, if needed. 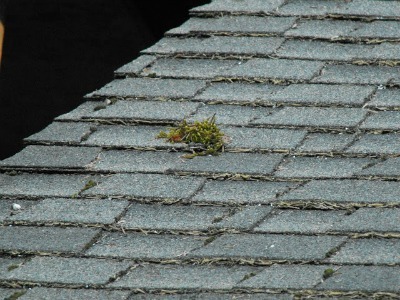 Remove moss, lichen and algae from the roof or home buyers will think that the house has been abandoned. Sweep loose moss from the roof with a push broom. For moss and lichen that are more difficult to remove, try power washing the shingles. When power washing a shingled roof, always aim the water spray down the roof, not up. If you spray up, you risk getting water under the shingles. Clean out the gutters and downspouts and make sure they are working properly. If your house doesn't have gutters, you should consider having them installed. Gutters keep your home healthy by moving water away from the building, preventing potential damage. If you suspect that you have an insect problem, take care of it now. The presence of insects will be disclosed during a home inspection and may discourage the buyers from continuing the home sale. Insect infestations go beyond most people’s comfort zones. For best results, call your local pest control inspector for a cost estimate on getting rid of the problem. When you're showing your house, be sure to leave your driveway free of vehicles. Power wash driveways and sidewalks to remove stains and debris. You can rent power washers at any home supply center. For cement driveways, use a pressure washer with at least 3,000 PSI. Remove grease stains first by soaking in cat litter or sawdust overnight, or use a concrete degreaser, available at all home center stores. Replace missing or damaged pavers or bricks on walkways and patios. Sometimes you can just flip pavers and bricks over and save yourself a little money. Repair cracks in concrete or pavement with patching kits, available at your local home center. 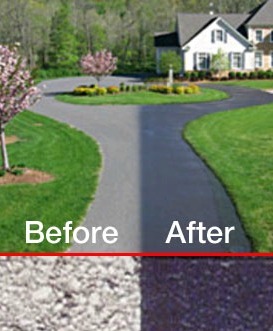 For asphalt or blacktop, try "Black Jack Blacktop Ultra-Maxx 1000 Driveway Filler and Sealer." For concrete, try "Quikrete Concrete Crack Seal." 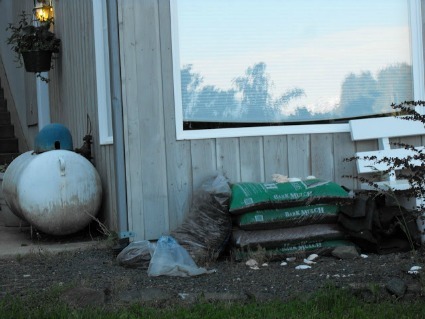 Gravel surfaces can be freshened by adding new rocks or doing a power wash. 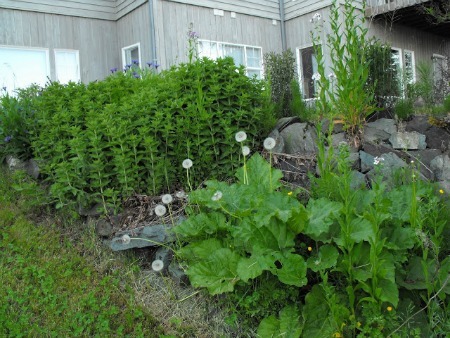 Kill and remove weeds growing from cracks and along the edges of driveways and sidewalks. Use an edger to make a neat sharp line for better curb appeal. Watch the video below by Askthebuilder.com demonstrating how to repair cracks in asphalt. He has a good tip on camouflaging the crack as well. 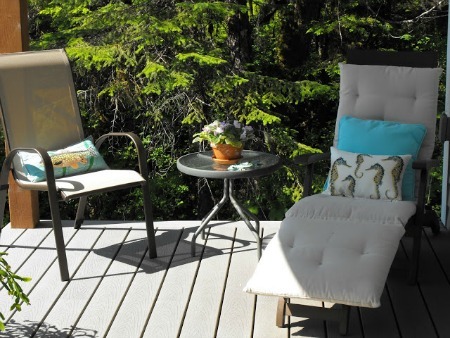 Remove clutter and worn out patio furniture from decks and porches. A good scrubbing with a deck brush or power washer may be in order. For better curb appeal, paint or stain the deck. 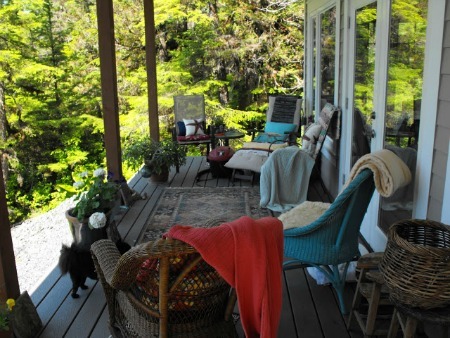 Note how the clutter will make it hard for home buyers to walk out on the deck! I staged the same deck by clearing out excess furniture and some of the plants. 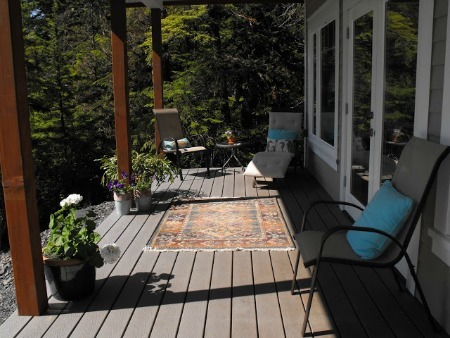 I kept the area rug to emphasize this deck as another living space, adding useable square footage to the home. Home buyers are always delighted by outdoor living areas where they can imagine themselves entertaining or relaxing with family and friends. Set the stage by creating cozy vignettes using patio furniture as pictured above. Set out a pitcher of lemonade and glasses with colorful napkins, placemats, and a plate of cookies. Accessorize with colorful pillows on patio furniture. Add potted flowers, ferns, or miniature trees to freshen and bring color to outdoor areas. 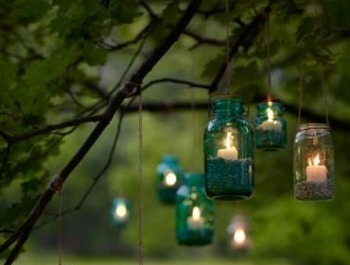 Place candles in old mason jars and hang from trees or eaves. Light them for home showings to create a lovely ambience. String white lights around the deck or front porch for evening viewings. Plant clusters of flowers beneath trees, at the base of the mailbox or in a line along the walkway. Fill empty window boxes with plants. For winter showings, add greenery to boxes. During the holidays, hang an attractive wreath on the door, over it, or one on each side. 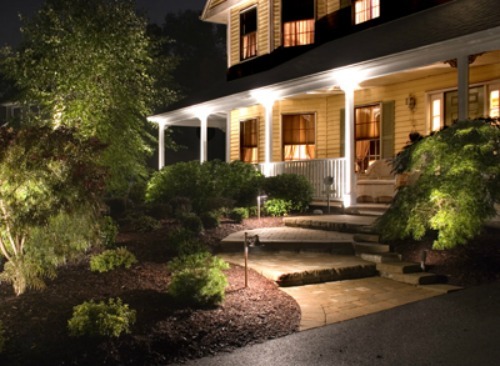 Use white lights, not colored, for outdoor landscape lighting-- they are more elegant. 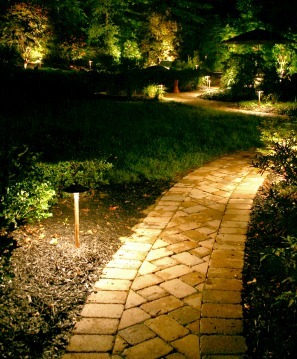 Add solar landscape lighting along each side of the path leading up to the house. Give your house better curb appeal by planting flowers around the mailbox. Be sure that the mailbox isn't falling over, rusty, or dented. Paint or replace, if needed. A fence gate should open easily and be free of “haunted house” creaks and squeaks. Oil the hinges with some WD-40. Paint, stain, and mend the fence, if needed. Flank the front door with large containers of flowers or greenery. Or go vertical by hanging pots of flowers or ferns. Flank the bottom of porch steps with a pair of urns; fill them with spiked plants or small shrubs. Place a wood bench or white wicker rocking chair on the porch; create a welcoming vignette with a small table, pitcher of lemonade and glasses. Place an arbor near the entry for old-world charm. 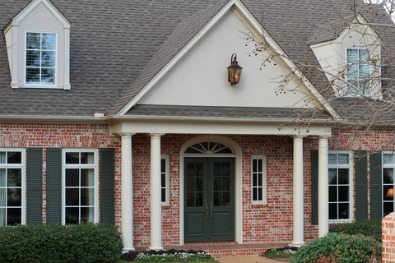 Add shutters in a complementary color as exterior window treatments. Paint or replace worn out or outdated shutters. Attach window boxes to the porch railings or under windows; fill with flowers or greenery to brighten the exterior. Place a brand new, neutral (no crazy messages!) door mat at the front door. For good curb appeal, seal-coat your asphalt driveway to give it a fresh, darkened look. You can easily apply it yourself. See the difference in the picture on the right. Go to http://garagefloorcoatingtips.com/asphalt-paint/ for information on choosing asphalt paint. Clear patios and decks of all clutter; stage with patio furniture and potted flowers or shrubs. If the garage door is ugly, painting it the same color as the house will minimize its existence. Otherwise, paint in a shade that complements the exterior paint colors.